Global Partners, the company that's seeking to add four steam boilers and three heaters to itsAlbany terminal, said late Wednesday that Albany County officials hadn't expressed any concerns about those plans previously, and hadn't asked to meet with the company on the project. The company was reacting to county officials' plans to put a moratorium on the project while the county studies the health and environmental risks posed by the expansion. Global's terminal at the Port of Albany is a major trans-shipment point for Bakken crude from North Dakota to refineries along the East Coast. The company has said it wants to install the heating equipment to help the crude flow more easily from rail tank cars to storage tanks. "Global will continue its operations in Albany, and will continue to work with federal, state and local officials, and the community, as well as our employees, customers, railroads and other partners, to ensure the safety of our operations," said Edward J. Faneuil, Global Partners executive vice president. He also said the company would "continue implementing a public outreach program focused on providing information to the community" about the boiler project. "Global's proposed project does not seek to expand the permitted storage capacity or total volume of petroleum products received at the facility and transported from the facility," Faneuil added. But a spokeswoman for Albany County Executive Daniel P. McCoy pointed out that he and other officials had previously expressed concerns in a Jan. 24 letter to Environmental Conservation Commissioner Joseph Martens about Global's expansion. "(W)e believe that a more comprehensive, public and transparent review of the company's plan is required," McCoy wrote in the letter to Martens. McCoy was joined in the request by Colonie Town Supervisor Paula Mahan, Albany MayorKathy Sheehan, Menands Mayor Megan Grenier, Cohoes Mayor George Primeau, and Watervliet Mayor Mike Manning. Meanwhile, members of People of Albany United for Safe Energy (PAUSE) rallied in front of the Department of Environmental Conservation headquarters Thursday to request a full environmental impact statement for the expansion of lobal's terminal at the port. 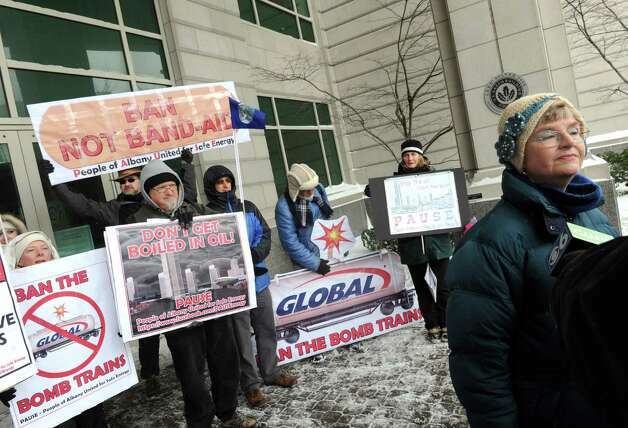 Posters called for officials to "Ban the Bomb Trains" and "Don't Get Boiled in Oil." The organization has raised concerns about how close trains carrying Bakken crude travel to neighborhoods in the Capital Region. Federal regulators have warned that the Bakken crude is far more flammable and dangerous than originally thought.